Who says a salad has to be green? Here, the purple (also known as red) cabbage is the star of the show. When shaved down into a little nest, the deep purple hues of this hearty vegetable contrast well with the bright orange of the carrot and radish red. Paired with a balsamic dressing, walnuts, and figs, this salad also becomes a contrasting taste of bitter and sweet. 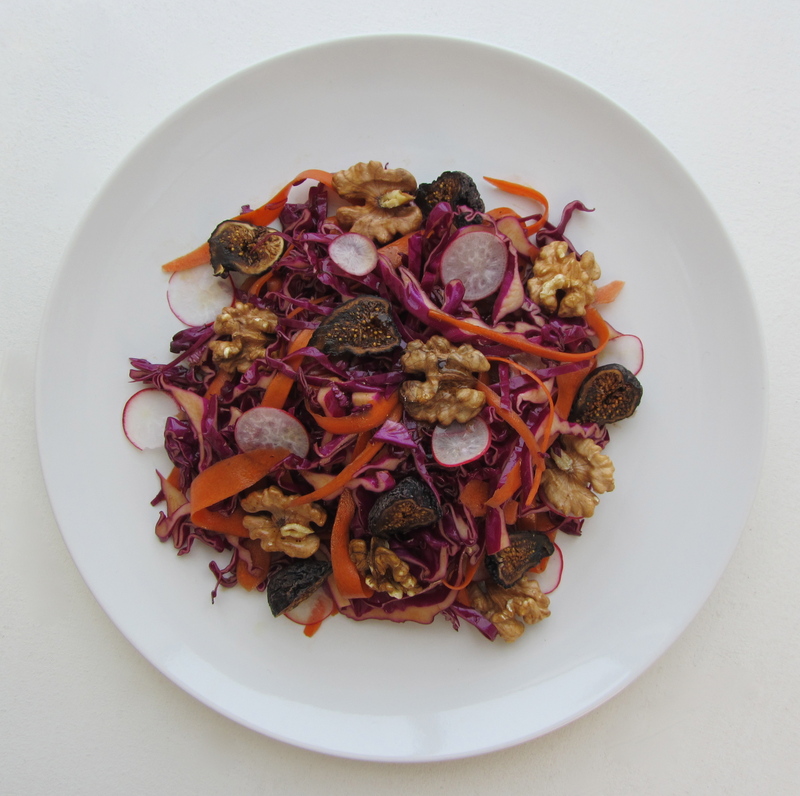 I like how the mild bitterness of the cabbage, radish, and walnuts are tempered by the sweetness of carrot and figs, with a little tang from the balsamic. 1. Thinly slice the purple cabbage to make about two cups worth. Using a vegetable peeler, shave the carrot into thin strips. Carefully slice the radish into thin discs (use a mandolin if you have one). Place the cabbage, carrot, and radish into a large bowl. 2. In another small bowl, whisk together the balsamic vinegar and extra virgin olive oil, with a pinch each of salt and pepper. Drizzle the dressing over the cabbage mixture and toss to evenly coat. 3. Place salad onto a serving plate, top with a handful of walnuts and sliced mission figs. This looks amazing. Have you ever tried roasting figs? Soooo goood! Thanks! And no, never tried roasting figs before. I’ll definitely try it! here’s a recipe from my blog: http://thestarvingartistfood.com/2012/06/29/rosemary-roasted-figs-with-goat-cheese/ – hope you enjoy!